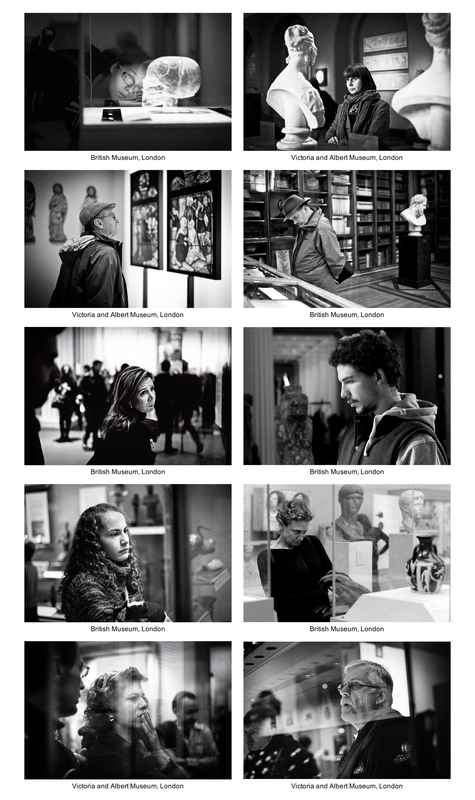 I have continued to work on my Museums project, which is a series of candid portraits of people looking at exhibits in London’s museums. The idea is to capture people in moments of reverie whilst gazing at exhibits. My aim is to make photographs which are sympathetic to the subjects whilst capturing the engagement between viewer and exhibit. By making candid photographs the hope is that the subjects are acting naturally rather than posing. As mentioned in my previous posts this work follows a long photographic tradition of candid street photography which has tried to capture people ‘lost in thought’, with precedents in the work of Paul Strand, Walker Evans, Harry Callaghan and more recently Philip-Lorca DiCorcia. My thinking has also been influenced by the Audiences series by Thomas Struth. Struth photographed people looking at Michelangelo’s statue of David at the Galeria dell’Accademia in Florence. His wish was to photograph people looking at a work of art from the perspective of the artwork. (Stuth, pp 218/219). I have been taking photographs on and off for about three months and have revised my selections as I have gone along. My latest, and by no means final, set is shown below. I have tried to select photographs which best meet my aim of capturing the an unposed reaction to an exhibit. I have also tried to come up with a set which has a variety of perspectives, angles of view, composition and lighting. I have chosen to use black and white because I felt that there was significant potential for bright background colours in the galleries to divert attention from the subject. The wide range of different lighting sources within the galleries also produces significant variations in colour temperature affecting the ‘look’ of the photographs. I wanted to eliminate this variability and using black and white does this.